quoted false statements without comment or challenge. I sent a link to the local Public Radio station — which, by the way, was in the middle of one of its periodic schnorrs fund drives. I pointed out that NPR gets a great deal of funding from the local stations and that maybe they would clean up their act if the stations complained. I wasn’t surprised when I did not even get a “your opinion is important to us” in return, because I’m sure the local management is quite happy with NPR’s ideological slant. …in an effort to continually monitor the way we cover the Middle East, NPR has hired a freelance researcher to conduct quarterly reviews of our coverage. The reports are prepared by John Felton, a former foreign affairs reporter and NPR foreign editor who covered international affairs and U.S. policy for more than 30 years, and submitted to NPR’s ombudsman. In a March 26 piece for Morning Edition [Eric] Westervelt reported on several allegations that the Israeli army used excessive force during the war. Westervelt’s piece centered around two reports in the Israeli news media: A March 21 report by Israel’s Channel 10 quoting an Israeli officer, in briefing his soldiers, as expressing little or no regard for the lives of Palestinian civilians; and reports in [left-wing papers — ed] Haaretz and Maariv on March 19-20 quoting Israeli soldiers as citing accounts of unprovoked killings of civilians. – The piece relied heavily on Shaul’s accounts without telling listeners that he is an active, vocal campaigner against Israel’s occupation of the Palestinian territories. Shaul is far from an unbiased source. While the information Shaul collected might well be true, he had an agenda in making this type of information public. Listeners should have been told more about him and his agenda. – The central element of the Israeli atrocities allegations came from a February 13 meeting of Israeli veterans of the Gaza war held at the Yitzhak Rabin pre-military preparatory course at Oranim Academic College in Tivon. Haaretz, and later Maariv, published stories on March 19-20 based on that transcript. Israeli soldiers told several stories, including accounts of the unprovoked shootings of an elderly Palestinian woman and of a woman and child. Westervelt cited both incidents but did not make clear (as additional Israeli media reporting had found prior to March 26) that the soldiers recounting these incidents had not witnessed the events and had only heard about them. – In the days after Haaretz first broke the story (on March 19) about Israeli soldiers accusing colleagues of committing atrocities, subsequent stories in the Israeli news media began to cast doubt on some allegations. The Jerusalem Post, YNet news, and other Israeli news organizations quoted soldiers as disputing both the specific atrocity accounts and the general idea that soldiers had disregarded Palestinian lives. Westervelt’s piece, however, did not mention any of these subsequent reports, which emerged before the piece was aired. Westervelt’s piece did quote an Israeli army spokesman, Major Avital Leibovich as saying the alleged atrocities were under investigation and suggesting that the soldier’s accounts were “hearsay” [the effect was to make the IDF appear evasive — ed]. Five days after the piece aired, the army’s judge-advocate general closed his investigation into misconduct allegations during the war, saying the newspaper reports were based on “hearsay” and had proven to be false. The soldiers who made the allegations had not actually witnessed or participated in the events they had described, the judge-advocate general said. Several human rights groups protested the ending of the investigation and suggested it was a whitewash. Westervelt reported the closing of the investigation in a [short –ed] news spot that aired on March 30. In short, the NPR reporter parroted accusations of murderous atrocities made by highly biased sources — sources which he should have known were biased — and then NPR aired the report after the horrific allegations had been shown to be false! I well remember my fury when I woke to hear this dishonest story, and posted this: “NPR’s shocking lack of journalistic integrity“. But apparently the NPR brass doesn’t pay attention to Felton, because they keep doing the same thing, again, and again, and again. Think about this: there is at least one American business that is paid to demonize Israel. The employees, well-paid professionals, go to work every day and think up ways to make Israel look like a moral monster, a rogue state dangerous to world peace for which the only remedy — as in the case of Nazi Germany, Imperial Japan or apartheid South Africa — is more than just regime change, rather, a fundamental change in the nature of the polity which can only be effected by force. They are creative people and they know their jobs. Their trade is building or wrecking the public images of politicians, products, organizations, companies and even nations. Today their goal is to prevent the Jewish state from defending itself by creating a mass of public opinion that sees its self-defense as war crimes. To prevent the Jewish state from defending itself, so that its enemies can finally succeed in doing what they have been trying to do since Israel was born, destroy it. 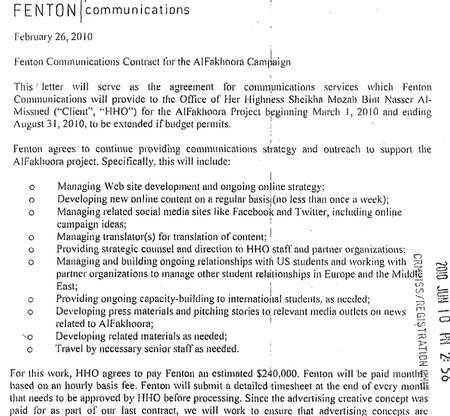 Fenton Communications, which has offices in Washington, D.C., New York, and San Francisco, signed two contracts last year with Qatar to develop “a communications action plan for an 18-month campaign” aimed at delegitimizing Israel and generating international support for the Hamas-run Gaza strip, documents filed with the Department of Justice show. The cash from Qatar bought a sophisticated U.S. media campaign aimed at manipulating public opinion to generate support for the Hamas-led government and the people of the Gaza strip. Here is the top-notch website built for Her Highness by Fenton. Fenton specializes in what they call “The Active Idea”: in this case the idea appears to be that Israel’s naval blockade and other restrictions on Hamas-controlled Gaza obstructs the ‘right to learn’ of Gaza’s children, thus denying them their human rights. In fact, the campaign has little to do with education per se, and everything to do with demonizing Israel. A video statement made by Al Fakhoora’s director, Farooq Burney, describes his experiences as a passenger on one of the ships of the Free Gaza Flotilla (I presume that it was the Mavi Marmara, because he claims to have been next to a ‘peaceful activist’ who was shot to death). He claims that the passengers were attacked, etc. and asks that people ‘pressurize’ [sic] their governments to ‘punish’ Israel and to ‘bring them to justice’. He also asks that we sign a declaration demanding that all ships be allowed to land at Gaza without interference. So much for education. Fenton also worked with The Council on American-Islamic Relations (CAIR) in 2005 to “improve public understanding of the American Muslim community, promote pluralism, and inject the points of view of American Muslims into the national conversation.” Note that CAIR has been shown to have close connections with Hamas. Of course, it’s entirely irrelevant to mention that Jeremy Ben Ami, director of the fake ‘pro-Israel’ group J Street, was a Senior Vice President at Fenton immediately before joining J Street. Right. Thomas Friedman is judged by many to be both knowledgeable and fair-minded about the Israeli-Arab conflict. After all, he’s been to the region many times and has been writing on the subject for years. He served as a correspondent in Lebanon from 1979 to 1989, and his book “From Beirut to Jerusalem”, published in 1989, is considered a classic. Israel today is enjoying another timeout because it recently won three short wars — and then encountered one pleasant surprise. The first was a war to dismantle the corrupt Arafat regime. The second was the war started by Hezbollah in Lebanon and finished by a merciless pounding of Shiite towns and Beirut suburbs by the Israeli Air Force. The third was the war to crush the Hamas missile launchers in Gaza. What is different about these three wars, though, is that Israel won them using what I call “Hama Rules” — which are no rules at all. “Hama Rules” are named after the Syrian town of Hama, where, in 1982, then-President Hafez el-Assad of Syria put down a Muslim fundamentalist uprising by shelling and then bulldozing their neighborhoods, killing more than 10,000 of his own people. In Israel’s case, it found itself confronting enemies in Gaza and Lebanon armed with rockets, but nested among local civilians, and Israel chose to go after them without being deterred by the prospect of civilian casualties. There is absolutely no similarity between Assad’s mass murder and Israel’s self-defense — not in the intentions of Assad and Israel, and not in the degree of civilian damage. Assad deliberately killed as many people as he could in order to send a message that insurrection against his regime would not be tolerated — and to exact satisfactory revenge for attacks on his loyalists (including an assassination attempt) by the Muslim Brotherhood. The IDF, especially in Gaza, made an effort to reduce harm to civilians as much as possible, and despite a journalistic and propaganda industry devoted to proving the contrary, succeeded quite well under the circumstances. The operations were all intended to stop terrorist activities, not to get revenge. Friedman knows the difference. Why did he join Israel’s enemies in their demonization project? Maybe he’ll write a comment to this post explaining that. There is something in common between the three wars that Friedman cites, though, although it’s not what he suggests. It’s this: In all three cases, the “international community” (primarily in the person of the US) stopped the fighting before Israel could finish off its enemies. In 2002, Arafat was allowed to remain barricaded in his Muqata. In 2006, Hezbollah was allowed to rearm and rebuild. And in 2009, the planned third phase of Operation Cast Lead, which would have brought Israeli soldiers into Hamas’ headquarters in Gaza city, was aborted before Hamas’ capabilities were seriously damaged, and without rescuing Gilad Shalit — who has just suffered his fourth year in Hamas captivity. So in addition to Friedman’s coinage “Hama rules,” referring to the vicious kind of example-making practiced by Hafez al-Assad and by the Russians in Chechnya, we need another phrase for the phenomenon of intervention to prevent Israel from bringing its conflicts to a winning conclusion. There are many possibilities drawn from almost every conflict that Israel has engaged in: 1956 rules, 1967 rules, 1973 rules, 1982 rules, 2002 rules, 2006 rules, 2009 rules, etc. I prefer ‘Gaza rules’, because this conflict best exemplifies the combination of an imposed end to the conflict and the use of pseudo-evidence to indict Israel of every imaginable crime, and to punish her for defending herself. But Abbas and Fayyad will not be able to sustain this timeout if Netanyahu resumes settlement-building in September, when the partial freeze expires, and if Israel doesn’t soon start gradually transferring control of major West Bank Palestinian towns to the Palestinian Authority. Bottom line: Israel needs to try to buy its next timeout with diplomacy, which means Netanyahu has to show some initiative. Because the risks to Israel’s legitimacy of another war in Gaza, Lebanon or the West Bank — in which Israel could be forced to kill even more civilians to squash rocket attacks launched from schoolyards by fighters who wear no uniforms — will be staggering. Somehow, the small matter of Hamas has been removed from the equation, as has the fact that the PA has found even overly generous terms insufficient in the recent past. Prove that Israel’s intention in three recent wars has been to harm civilians. You can’t. Explain how concessions to the PA will bring peace, especially in the presence of Hamas. You can’t. Explain why Israel is the only state in the world whose ‘legitimacy’ is in question. You don’t want to try. The Goldstone report contained hundreds of accusations that Israel deliberately harmed civilians, and indeed even falsely concluded that the object of the operation was to hurt and kill civilians. The accusations were based mostly on hearsay evidence collected from Gaza residents by biased NGOs (Human Rights Watch, etc.) often with the assistance of Hamas-provided guides and translators. It seems to me that the new guidelines would not prevent a similar ‘Goldstoning’, which is by nature a disingenuous process, a diplomatic lynching. Indeed, by increasing the degree of contact with civilians — if, for example a village had to be evacuated — they would increase the probability of incidents which could be spun as brutality. It also seems that this would provide an opening to create Mavi Marmara-like events in which ‘civilians’ would ‘resist’ the IDF’s attempt at ‘ethnic cleansing’, bringing about violent clashes. Finally, it would give Hamas fighters an opportunity to set their booby traps and ambushes and fade away. This is reminiscent of the approach to war-fighting now taken by the US in Afghanistan, in which the use of firepower and air support is being strictly limited in order to try to eliminate collateral damage. Of course the problems faced by the US and Israel are different in important respects, but the idea that reducing harm to civilians is higher priority than killing the enemy is similar. This approach tackles the challenge of asymmetric warfare in exactly the wrong way, a way which amplifies the advantage of the side that uses irregular troops, deliberately fights from among friendly civilians, and ‘wins’ by getting outside powers to clamp down on the other side. Some have forgotten that the object of war is victory, to crush the enemy, whatever that takes. Things like building civilian infrastructure may be projects that can and should be undertaken, but not as part of war, and not by soldiers. In actual fighting, all reasonable efforts which do not stand in the way of victory should be made to prevent harm to civilians, but these cannot override considerations of winning the battle and the war. Israel can’t win in the UN no matter what it does. But it can win the war on the ground, and it should not sacrifice the latter for the former. Hamas and the forces arrayed against Israel brought the last war and will bring the next one. They have tried, and to some extent succeeded, to turn the truth on its head and convince many that the Jews of Israel are the aggressors. But lying doesn’t make it so. Those that make war on a nation that desires peace, as Sherman implied, are responsible for the consequences. Hi, I’m not dead yet! Abdelbaset Ali Mohmed al-Megrahi, the convicted Lockerbie bomber, has made a truly remarkable recovery. As you may remember, in December 1988 a bomb exploded in the cargo hold of Pan American flight 103 over Lockerbie, Scotland, causing the aircraft to break into several pieces in the air. 270 people in the plane and on the ground died of decompression, massive trauma and fire. 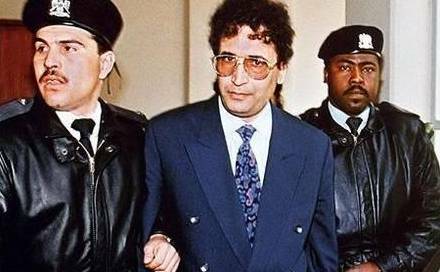 Megrahi, allegedly a Libyan intelligence officer, was indicted in 1991 but it required the UN to apply sanctions to Libya and protracted negotiations with Libyan dictator Qadaffi before he was finally handed over to Scottish authorities in 1999. In January 2001, Megrahi was convicted and sentenced to life imprisonment. In 2003, Libya accepted responsibility for the bombing. Now it gets interesting. An appeal was denied in 2002, and a second appeal was filed in 2007. During the trial of this appeal in 2009, Megrahi asked for release on ‘compassionate grounds’, which may be granted under Scottish law when a convict can be shown to have three months or less to live. His lawyer claimed that he was suffering from terminal prostate cancer and would not survive three months. On August 2009 he was released from prison and flew home to Libya where he received a hero’s welcome. Prof Sikora, one of the examining doctors who was paid a consultancy fee last July  to examine Megrahi, told The Sunday Telegraph this weekend: “My information from Tripoli is that it’s not going to be long [before Megrahi dies]. Prof Sikora said it was just possible that Megrahi would be alive in several years time but added: “It’s highly unlikely. There is a 90 per cent chance he will die in the next few weeks. Well, here it is June and he’s still hanging on. Today there is an unexpected topical connection. When Megrahi was released there were claims that the British government pressured Scottish officials to approve the release because of considerations relating to trade — in particular, an oil deal. And guess what oil company was involved? In his interview today [Sept. 4, 2009], [Foreign Secretary Jack] Straw admits that when he was considering in 2007 whether the bomber should be included in a prisoner transfer agreement (PTA) with Libya, Britain’s trade interests were a crucial factor. When asked in the interview if trade and BP were factors, Mr Straw admits: “Yes, [it was] a very big part of that. I’m unapologetic about that… Libya was a rogue state.